David Russell, as I have written before, was for many years director of music at St Mary’s Cathedral. He was unjustly dismissed by the church, then reinstated after bringing proceedings to vindicate himself in the NSW Industrial Commission. The commission, however, does not have the power to award any costs. If he had lost in the commission, that would have protected him, but when he won, it didn’t help him. After that, he brought proceedings in the Supreme Court to recover his costs and other expenses incurred as a result of the church’s breach of its contract with him. The court found that the church had breached its contract, but that he couldn’t be awarded his costs in the commission or the other damages he claimed. He appealed to the Court of Appeal but was unsuccessful. I have written about these cases on this blog (1), (2). There is one unflattering thing I said about him in the first of these posts (I won’t repeat it here, but it started with mentioning that when younger I thought he was fat), but actually I thought I made it clear that he had been hard done by by the courts and that the church was treating him shabbily. Since then, David Russell has left his position as Director of Music. He has published a memoir, Surplice to Requirements. I bought a copy for $35 from Gleebooks, where it was recently launched by Fr Edmund Campion. There is a lot in the book which is of interest. The first part treats Russell’s (Catholic) youth and early involvement in church music and music education in Sydney. He confesses to what is a probably an offence under the Copyright Act (reverse engineering – from the piano score and listening to recordings – of the non-available orchestral parts for Oliver! when he was music teacher at Enmore Boys High in 1969), but I doubt if he is going to be prosecuted for that. There is maybe a bit too much detail for the general reader about his overseas tours with the cathedral choir, ending with a tour to Europe just before the outbreak of the first Gulf War in 1991. Then, at page 203, the narrative jumps forward to 1999 and his arrest by officers from the child protection squad concerning allegations connected to David O’Grady which, so far as they related to events which concerned Russell, were ultimately found by the Industrial Commission not simply to be not proven, but actually not to have occurred. This section of the book (roughly the last third) is obviously the prime reason for its publication. Russell wants to set the record straight. It has basically three parts. First is the initial call from the police and criminal charges (brought on the flimsiest of evidence against him; dismissed with costs), after which all seemed over and he returned to directing the choir. A couple of years later, under pressure from the relevant government authorities to set its child abuse risk protection in order, the church launched its own investigation (of a sort) and dismissed him. This is the second part, leading to the the Industrial Commission hearing. These parts are the probably the best in the book, at least for me reading as a lawyer. Of course these are the bits which have a happy ending, or at least a great victory, for Russell. The third part deals with the aftermath: the unsuccessful court cases (dealt with rather generally) and the pressures and intrigues (his word: there were undeniably manoeuvres) which ultimately led to Russell leaving his position at the cathedral. During this last period, Russell kept working at the cathedral, preparing in particular for the visit of the pope in 2008 – which must have been a wonderful moment for him. Shortly after this, there was a further complaint or complaints that Russell had dealt over-harshly with a boy who misbehaved in a rehearsal. Russell was suspended again. He wasn’t told who had made the complaint, though there are dark hints. After Russell left the job he received a letter stating that the last complaints [sic] had been found to not merit any disciplinary action against him. Russell’s account of the denouement is rather cryptic [not a pun]. He says “for legal reasons, I cannot recount the straw that eventually broke this camel’s back.” I take that to mean there has been some kind of legal settlement with the usual confidentiality clauses – after all, Russell was liable for the costs of the court proceedings and so vulnerable to pressure on that account, at least to the extent that he had any assets left by this time. This doesn’t stop him having a swipe at some of the people who he thinks have acted dishonourably in the course of this endgame. When I started writing these thoughts and recollections I had no idea where they would take me. The only certainty I had was a need to have my ‘view from the peak’ in some way validated. As he correctly points out, “Like flypaper sticking to your fingers, this whole affair refuses to go away.” He then refers to an SMH story (about O’Grady being struck off as a nurse) which he felt was unfair to him, especially because it was on the net. I agree that story was unfair, because it referred to the claims made about Mr Russell but merely said that he was reinstated when the Industrial Commission found no evidence to support the claim. That was understating the strength of the commission’s finding in Mr Russell’s favour. Apart from the Herald site, which is disseminated internationally, there were other Blogs, which had an extraordinary amount of private detail about the various activities I had pursued in my life. The Operas in which I had appeared, as well as the lighter works by Offenbach and Sullivan. And I sang in some excellent pieces from the American stage. There was an attempt to disparage me by quoting the paucity of the cathedral salary that I was prepared to accept. Perhaps the writers of this diatribe would be shocked to know that at the commencement of my term I was paid nothing at all. I think he was talking about me there. You can click the links above and see why. I mentioned his salary ($25,000) to show Mr Russell’s fight to clear his name and get his job back was not about money but about vindication and of course, his life’s work. If that salary reflected poorly on anyone, it was on the church for paying him so little. In my observation, churches are quite often terrible employers. You are meant to be doing it all for God and if they don’t like you or don’t want you, then they are doing what they do for God too. I didn’t think either post was a diatribe. It just goes to show that you can never see yourself as others see you. On Sunday afternoon to a concert by the Sydney Omega Ensemble at the Conservatorium. I was invited to go by a friend who has taken it upon himself to assist with the management of the group. I was a bit embarrassed when he actually paid for my ticket in front of me – if I was going to go, I wouldn’t really have grudged the admission price – but hell, a free ticket was the deal and when you’ve been a lawyer for a while you get rather a hard heart for sticking to the deal, whatever it is. Eleven young, vibrant performers with a wealth of enthusiasm and musical skill, together formed the Sydney Omega Ensemble at the end of 2005. Only three of that eleven featured in Sunday’s concert, the remaining two (violinists making up the string quartet) were “guest artists,” and therein lies a bit of a problem. If you go to the ensemble’s website you’ll see that its basic programming principle is that you can have anything you want, so long as it has a clarinet in it [that’s an allusion to Henry Ford, in case you didn’t notice]. This is because the ensemble’s “artistic director” and (it is fair to assume) instigator is its clarinetist, David Rowden. The founding members of the ensemble in 2005 were all young musicians on the cusp of a professional career. Since then, some of them have gained salaried toeholds in the musical establishment; others haven’t. The appearance of “guest” violinists on this program (not a one-off appearance: they were “guests” at the ensemble’s previous concert) is a result of the original violinists being otherwise engaged. Obviously, people are going to move on, and the membership of a group cannot remain static. Even with a stable membership, it must be a nightmare getting everyone together, not only for the performances, but also for rehearsals. I was told that there had been three rehearsals for this concert: that wasn’t really enough for the Smetana – our expectations about string quartets are based on ensembles that play together for a sustained period to develop the necessary rapport and, in the case of touring quartets, repeat the same program many times. In the case of the Weber quintet (a terrific work: I’ve been humming the catchy minuet ever since), this didn’t matter so much, as David Rowden was able to provide the focus as clarinetist in what is essentially a brilliant concertante role. I want to hear chamber music live. The possibility of this, however, depends on ensembles being able to maintain their existence and, in particular, sufficient other people coming together to help support them. That’s an issue for all musicians (audience = money = sustainable existence) and it’s a kind of Darwinian struggle which is hardly unique to the Sydney Omega Ensemble, which must have been disappointed and probably discouraged by the pathetically small audience that turned up on this occasion. It’s also an issue for those, like me, who want musicians to keep playing and practising and rehearsing and performing so we can hear what they have to play. The horrible fact is that music, like art (I was thinking of visual arts but the argument holds more generally than that), or sport (considered as performance), is an enormous Ponzi or pyramid scheme of tuition and youthful aspiration and endeavour where only a minority will ever be left playing or working in the field. In each case, there is something which people actually love to do, but in order to be able to do it well they need to attract the support of others, and the regard of others is essential to any performative aspect. The availability of recorded music in the twentieth century has brought a wider range of music to everybody, but at the same time it has almost certainly reduced the prospects of musicians in general by concentrating the opportunities on those at the top of the tree whose performances can then be mass-distributed. Live performances need some institutional focus (venue/ensemble or performers/promoter) which will generate actual attendances in the face of this abundance and ubiquity of recorded product. Everyone always has plenty of suggestions as to how audiences can be built up and maintained in a particular case. I have my own ideas about the SOE, but I don’t think it would be fair for me to offer commentary from the sideline [yuck! sporting metaphor!] here. They do play well. If they can manage it, there is room for their continued existence, particularly in offering performances by mixed ensembles of works which otherwise only get occasional exposure. They have plans for next year which they can’t announce officially until everything is teed up with the venue. They’re not giving up yet, and I say: good on them. Just in case the gloomy circularity of spiralling truisms in this post gets you down as much as it is getting me down, I just want to make clear that I enjoyed the concert (that includes the Smetana) and it would have been well worth the asked-for $35 if I hadn’t been given a free (to me) ticket. Last night to the last in the SSO’s Prokofiev festival. For the orchestra, this festival really started when they went on tour with the Prokofiev 5th Symphony in the middle of October, so, amongst other things, they were drawing to the end of a continuous period of 5-6 weeks playing Prokofiev with their Principal Conductor, Vladimir Ashkenazy. There was also a festive atmosphere abroad generally down at Bennelong Point: outside in the forecourt, Australian Idol was rehearsing its Sunday final with a pretend audience drifting in and out of the front of house toilets and bars; across Farm Cove in the Botanic Gardens a light show swept the tree tops for some party or other; the humid night tossed and teased with drops of never-quite-rain; all five auditoriums [-a?] had something on. Inside, the concert hall was comfortably packed. Billed as “magic,” the title might more accurately have been “Fantasie” in the Schumannesque sense. It was truly illuminating to set the 5th concerto against the Lieutenant Kije suite: this placed what is otherwise a structurally rather puzzling work (the concerto: the suite is straightforward) in context. I even thought I detected reminiscences/portents (sans saxophone but with high bassoon) of a Kije-esque theme. Perhaps after a torrid week or so leading up to a 4-day trial, I had just been so bereft of music that any music heard on Friday night would have worked enchantment. Be that as it may, the rewards of the sustained encounter between orchestra, conductor and composer seemed palpable. There was a unanimity of playing and, even more, of style. I had been too laid low with my brought-back-from-China cold [did I mention I have just been to Shanghai for 2 weeeks?] to get a fair impression of Alexander Gavrylyuk’s playing of the first concerto a fortnight earlier, but this time he scored a triumph. To play 1, 3 and 5 within such a short period is no mean achievement. Gavrylyuk grinned with exhilaration (or so it seemed to me: he must have been quite charged up) at the end as he rushed on and off the stage to take his bows before treating us to an end-of-term encore by way of a transcription (well a bit more than a transcription: I presume Liszt-Horowitz) of Mendelssohn’s wedding march. You wouldn’t want a whole program of pieces like that, but in the circumstances it went down a treat. From minute or so before the end of the first movement of the concerto until about half a minute into the second movement of the concerto, we were also treated to a little bit of electronic buzzing coming through the PA. This is always disappointing: can’t the people on the switches keep their hands still? Perhaps they were fiddling around getting ready for the second half, where John Bell gave us an introduction to “The Ugly Duckling” before Jacqueline Porter took over for the quasi-cantata proper. That wasn’t entirely free in my mind from a suspicion of further electronic enhancement, and it seemed to me that in ‘Peter and the Wolf,’ with which the program finished, the technical fellows allowed themselves the luxury of a little orchestral amplification to match the narration with the orchestral sound. I’m less than keen on this sort of thing, though it didn’t seem to worry anyone else. Perhaps I was imagining it: but in P&W the orchestra seemed just implausibly loud given its modest scale and there was a boomy bloom to the sound which went beyond the concert hall’s usual echo. So: a brilliant first half and a more mixed (in more than one sense) though still well-played second half. Sometimes, when one is asked to compare people, the more tactful and even truthful answer is to simply say that they are different from each other. To hearken back to an earlier post, I think I still prefer Shostakovich to Prokofiev – but that is me rather than them. In fact, and unsurprisingly really, they are different. Since then, I’ve generally lapsed into an aestheticist quietism. My urges to express my indignation about some facets of the law and to expose some other more quirky ones have both subsided. I’ve left the press alone – everyone can read the paper, after all. Just in case the allusion is lost on some of my younger readers [if any], the allusion is to a song by Carly Simon, reputedly about her ex-husband, James Taylor (though the truly tragic Wikipedia link I have given allows that it may alternatively have been Mick Jagger). Just while we’re on this topic, I’ve long thought that the accusation in the song that someone thinks the song is about them contains its own elements of vanity, as well as being a strange kind of having cake and eating it too. According to an article I read a few years ago, you’re either for one or the other, and certain other choices line up with that. I’m a Tintin man myself, though I don’t think the rest of the hypothesis holds very well. For one thing, if you prefer Tintin, you’re supposed to be neat and tidy. 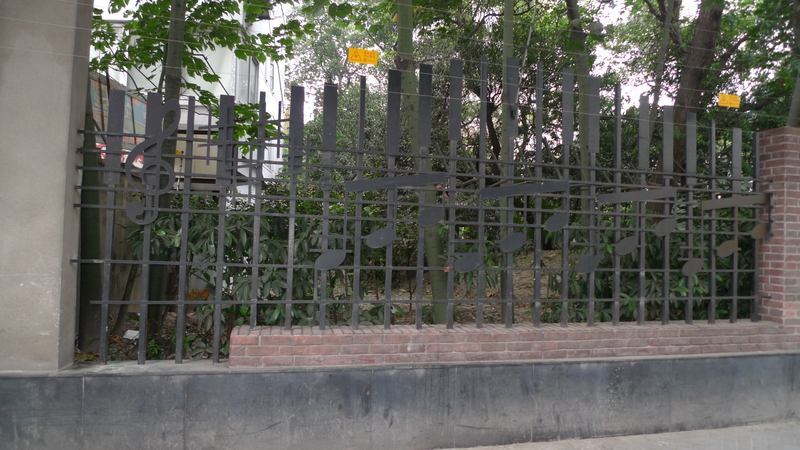 After my third concert in the SSO Prokofiev series (plus the preview at Shanghai – did I tell you I’ve recently been there? ), I’m beginning to wonder if I’m a Shostakovich man myself. For me, Prokofiev’s piano sonatas are more interesting than quite a lot of his more public, symphonic music, at least going on what I heard tonight. I might manage a more considered view later. Today, for the first time, I used one of those new automated checkouts – it was at Coles on the corner of King and George Streets in the city: the resort of the desperate when heading home rather late and in search of a prepared meal. I felt a bit bad about doing the checkout staff out of a job, and I’m sure that there isn’t any saving passed on to me. There were special attendants hanging around to tell me what to do, and when I mentioned my bad feeling, one of them claimed that staff weren’t to be had. That is always rubbish. Last Friday, re-entering Australia from Shanghai (sorry to be a bore about this but I don’t get out of the country that often) I used my new e-chipped passport for the first time. You have to stare at the camera which checks that your physiognomy matches that when your photo was taken for the passport. I suppose I am throwing immigration officers out of work but strangely or not, I don’t feel so bad about that. Actually, they probably aren’t out of work yet, but just mounting more elaborate defences of Fortress Australia. Should I be grateful? There was some saving of time, at least while the new mode of passport is in a minority, but it was all for naught by the time we had waited for the luggage to be unloaded. I returned from Shanghai on Friday morning expressly for the purpose of catching the last night of Opera Australia’s Peter Grimes. I am very glad I did. This production has been extensively documented on the internet, including by a number of people who went more than my two times, to the point that there is little I need or could add by way of detailed observation. Had I not been going away, I too would happily have gone more than merely twice – and I, too, had the chance (which I couldn’t take up) of company rush to assist me in such a project. That, too, as I have commented elsewhere, is a cause for concern and dismay. What is the basis of the resistance to such a work which makes such company rush tickets possible or necessary? I asked a colleague, and I know she is an opera-goer, if she had been. She told me she hadn’t. She didn’t like Britten, she said, because somebody had told her he was a Nazi sympathiser. She is Jewish, so this is a determinative factor for her. I said: “Don’t be silly. He was a homosexual pacifist who ran away to America along with Auden and Isherwood!” [OK: I was simplifying things a bit.] She said: “Auden was a Nazi.” Let’s just say I was stupefied. It’s not immoral, I suppose, to be ignorant, but some ignorance can be pretty shocking. But back to the work, and the production. Seeing and hearing it again, what struck me was its dramatic sense, particularly in the pacing and juxtaposition of different moods and genre-moments. As with the Sinfonia da Requiem, there are moments of Shostakovian (or post-Mahlerian) grotesquery (the policemen’s scene from Lady Macbeth of Mtsensk came to mind). There is comedy, pathos, tenderness, loudness and softness. There is dramatic preparation (for the storm, for example, but also, has been pointed out, between the party music and the subsequent roar of the crowd). Less notably (because it is an easier thing to achieve) though not less effectively, there is recapitulation and reminiscence. Another thing which really strikes me is the room the work allows for a variety of interpretation and response. As to the production, my respect for it is enhanced. 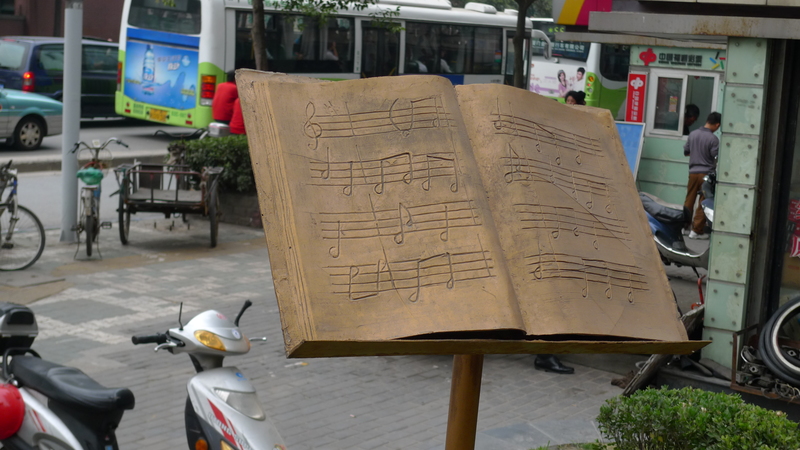 It is responsive to the text and the music in just so many ways. So much detail has been so very carefully thought out and executed. I still have a niggling reservation about the postmodernish ramping up of the role of Dr Crabbe – is this really necessary? When he delights in the playfulness of the Borough boys (surely Crabbe as Britten here, nudge, nudge) I find it intrusive and even a little embarrassing, as well as heavy handed underlining – does the director think we won’t notice the lads without this? But conversely, despite all the business of clearing the hall of chairs during the passacaglia (which actually is co-ordinated brilliantly with the music), it is difficult to imagine the coup-de-theatre of the stage-within-a-stage moving forward working so well if it was simply left to the stage machinery to execute. The ensuing scene in Grimes’s hut is the pithiest part of the production, and is masterful, both as to the circumstances of the boy’s death (caused by Grimes but, in a way, also by the mob) and the ending – both Balstrode’s detection of something amiss and Mrs Sedley’s. Enough has been said elsewhere about the performances, which were uniformly excellent. Maybe Catherine Carby was on the youthful side for Auntie, but that is a question of casting rather than performance, and she did have a terrific 1940s look. I take back any earlier implicit criticism of Mark Wigglesworth’s musical direction. It seems unbalanced and unfair that most operas billed to be conducted by the musical director [ie: Richard Hickox] in recent years had internationally acclaimed casts singing with the best of Australia’s resident opera singers. There have been expressions of regret that there has been no permanent visual record of the production made which might result in the issue of a DVD. If this were to require the use of the unsightly taped-on-head microphones preferred by the ABC for Cosi or Pinchgut (and, I think the ABC) for its own recordings, I could do without it: that is unthinkable. The use of such microphones is disfiguring and seems to me to be an example of management acceding to the easiest path proposed by technicians. 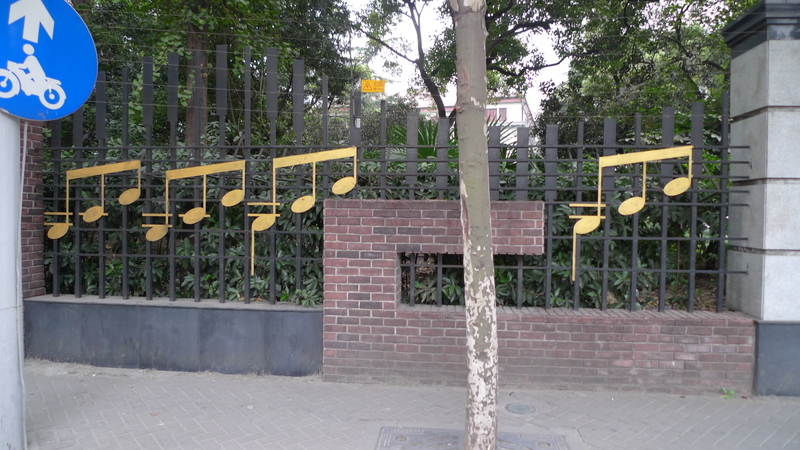 On the fence outside the premises of the Shanghai Philharmonic Orchestra. 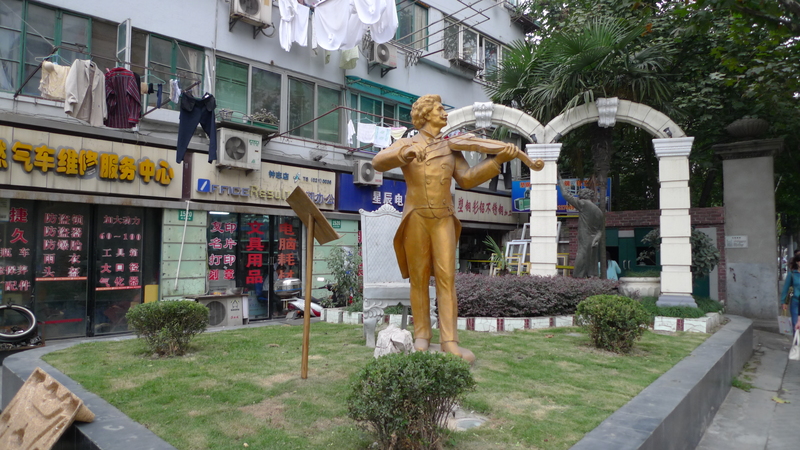 Johann Strauss also scores a spot on the adjacent corner. I’m still puzzling over the identity of the disconsolate chap lurking by the columns. You are currently browsing the Stumbling on melons blog archives for November, 2009.